This is the discussion thread for the RGL HL Season 2 Intermediate division. Congratulations to the Season 1 champions, ANTHRAX! This is the discussion thread for the RGL HL Season 2 Open division. Congratulations to the Season 1 champion, barcode-HL! This thread will be used as feedback for the RGL Experimental HL Cup. Quote: As the first ever season of RGL HL has concluded, we are now preparing for the second season! This preseason cup will focus on testing potentially new and viable maps that could be played during the season. It is a 2-day tournament for teams / groups of friends of ANY skill level to play. It is also completely free. We are looking into rewarding participants with medals. Please note that this is an experimental cup for potential maps that could be played during the season. If you are in favor or not of a map being played, we encourage you to signup, play the cup, and voice your opinions on the forum. This is a way for us to gauge community opinion on the map list. Thanks. Each division will have divided into round robin groups consisting of four teams, which can lead to multiple groups for each individual division. Teams that sign up earlier will have priority in terms of placement and getting a spot into the preseason cup, so please sign up as soon as possible instead of waiting until the deadline. Millstone will be played best of 3, Synthetic played bo7 (first to 4), and Vanguard being played first to 5. A: All Skill Levels are welcome! Teams will not select their division to play in, but Admins will look at the teams past comp experience and place you with three other teams of similar skill. This will help against teams purposefully sandbagging and help make a fun competitive environment for new competitive players, as well as highly experienced players. A: Although this is a map testing cup, results of returning and potentially new teams for Season 2 will be looked at to help determine division placement. We encourage all teams to try their best to not only help generate feedback for the new maps, but also to help practice for the next season. Q: How do we get server info? A: RGL HL servers will be reserved for the Invite/Advanced matches. Any remaining servers can be used for other divisions. Please contact an admin in advance if you do not own a server or do not have access to renting a server. 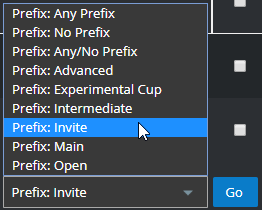 Remember to choose a division prefix in the "Subject" area if you are looking for scrims in a single division. If you do this, it will make it much easier for people to see what division you are looking for scrims in. Any specifications like "High IM" or "Playoffs IM"
Quote: Fast Forward is looking for playoff invite scrims this weekend. We will host with our server and can scrim either upward or product + your map. This is the discussion thread for the RGL HL Season 3 Advanced division. Congratulations to the Season 2 champions, Amicitia Nova! You can view last season's Advanced discussion thread here. This is the discussion thread for the RGL HL Season 2 Advanced division. Congratulations to the Season 1 champions, Heals on Everyone! Looking for Player posts are recommended for returning teams or people looking to start a new team with a few other players. Remember to choose a division prefix in the "Subject" area if you are looking for a team in a single division. If you do this, it will make it much easier for people to see what division you are looking to play in. The title/subject of an LFP post should be marked with the division you wish to play in under "Thread Subject" and the specific classes you are looking for. Quote: Hello, I am creating a new Highlander team to compete in RGL Open this upcoming season. The current players on our team have played at least one season of Highlander in the past. We plan to scrim Saturday/Sunday 8:30 & 9:30pm eastern with our pregame @ 8:30pm eastern on Mondays. We will be using Mumble for comms. For this season, we aim to make playoffs and then continue in main the following season. What Division should I apply for? The open division is open to players with experience levels from Steel to people who are completely new to the competitive scene. Intermediate is recommended for players who are decently experienced with a couple of seasons of competitive played and the basics down. Skill range of UGC Low-Silver. Main is recommended for players who the following experience levels. Skill range of UGC Mid-Silver. Players here are moderately experienced and are on the road of being able to play in Advanced and Invite. Advanced is recommended for players who have a lot of experience. Skill range of UGC High-Silver. You should have Platinum level experience to join this division. Players here are considered to be the best that Highlander has to offer. To find division specific posts only, use the prefix search tool located at the bottom of the sub-forum. Then select the division you wish for posts to show from that division only. Any notable site updates will be posted here. Threads that are created in this forum are only visible here and not the sidebar so it may take a couple of days for a forum moderator or admin to view your request. If your desired new forum name is not your current RGL alias or makes you harder to identify, then the request will be denied. Quote: Wrote: Hello, I would like my name changed to exa_. Quote: Hello, I would like an Intermediate Leader role. Quote: Hello, I would like to be verified.